Kathleen in San Jose, California. Monday, January 7, 2019 6:15 p.m. Aqus Café Foundry Wharf, 189 H Street, Petaluma. “Rivertown Poets: Amuse-ing Mondays.” I’m the featured reader, along with William O’Daly, and an open mic follows. Host: Sandra Anfang. Sunday, February 10, 2019 3:00 p.m. East Bay Booksellers, 5433 College Avenue, Oakland. Poetry Flash presents Kelsay Books poets Rachel Dacus, Carol Lynn Grellas, Eileen Malone, Lenore Weiss, Andrena Zawinski, and me. Tuesday, March 5, 2019 6:30 p.m. Park Branch Library, 1833 Page Street, San Francisco. “Women Poets in Conversation.” To celebrate Women’s History Month, Lynne Barnes and I interview each other and read from our books. Lynne, author of Falling Into Flowers, recently retired from San Francisco Public Library and has lived in the city for over forty years. Wednesday, March 6, 2019 7:00 p.m. Octopus Literary Salon, 2101 Webster Street, Oakland. Pandemonium Press presents “On the Road: Rich with Possibilities.” I read with Bruce Bagnell, Andrew O. Dugas, and Jan Steckel. An open mic follows. Host: Leila Rae. Wednesday, June 12, 2019. Sacred Grounds Café, 2095 Hayes Street, San Francisco. I feature in this long-running poetry series hosted by Dan Brady. An open mic follows. Friday, September 27, 2019. St. Alban’s Episcopal Church, 1501 Washington Avenue, Albany CA. “Fourth Friday Formal.” I am one of two featured poets reading formal verse in this terrific series curated by David Rosenthal. Friday, November 8, 2019. Nefeli Caffe. 1854 Euclid (near Hearst), Berkeley. I read as part of the Last Word Reading Series, a long-running poetry series hosted by Dale Jensen, Ralph Drano, John Rowe, and Grace Grafton. The evening includes an open reading. Admission is free, but a one-drink or one-plate minimum is suggested. Sunday, July 1, 2018 2:00-4:00 p.m. Poetry reading in Benicia, California at Rosanna’s European Delights, 305 First Street. Host: Johanna Ely. An open mic follows my featured reading. Everyone’s welcome at this full-service pastry and café, which “takes baking into the level of high art.” I can’t wait for those eclairs! Thursday, September 6, 2018 7:00 p.m. Greenhouse artist studios, 229 Flamingo Road, Mill Valley. Five San Francisco and Marin County poets read under the stars in a garden adjoining vibrant art studios: Cathy Shea, Kate Peper, Sarah HaBa, Kelly Alsup, and I. Join us for a free event. Refreshments–including eye candy–book sales/signing, easy parking. Saturday, October 13, 2018 7:00 p.m. Frank Bette Center for the Arts, Alameda. I read with award-winning Berkeley poet Susan Cohen, author of A Different Wakeful Animal. Open mic and refreshments. 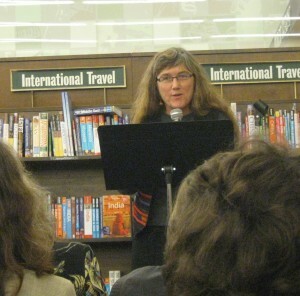 Host: Jeanne Lupton. Saturday, October 20, 2018 8:00-9:00 p.m. Mission Yoga, 2390 Mission Street, #200, San Francisco. Lit Crawl panel: “Soul-Making from A to Z” Six of us Soul-Making Keats contest judges read winning entries and talk about what we look for as we judge. Lit Crawl is big fun up and down Mission and Valencia Streets once a year in October! Sunday, October 21, 2018 1:00 p.m. Art House Gallery, 2905 Shattuck Ave, Berkeley. Fire and Rain: Ecopoetry of California launch reading. Come join editors Lucille Lang Day and Ruth Nolan and 27 of us contributors to this stunning new anthology. Food, drink, book selling/signing/celebrating. Sunday, November 11, 2018. 7:00 p.m. Green Apple Books, Clement & 6th Ave, San Francisco. Sanctuary launch reading. Editors and contributors to this timely new anthology gather for a reading and signing. I’ll be reading my poem, “Perfect Game.” See you there! Saturday, July 30, 2016 6:30 p.m. Rolling Writers Reading Series: Love! Rolling Out Café, 1722 Taraval Street, between 27th and 28th Avenues, San Francisco I will be reading, along with 5 other writers, on the endlessly swirling subject of love. Come get dizzy with us. Host: Jon Sindell. www.rollingwriters.blogspot.com. Thursday, April 30 2:00 p.m. Skyline College Quad I participated with eight colleagues in the Skyline College Faculty Poetry Reading. I happily read with fellow English department instructors Michael Cross, Chanel Daniels, Kathleen Feinblum, Katharine Harer, Nathan Jones, Janice Sapigao, Michael Urquidez, and Rob Williams, who organized an amazing month of campus-wide poetry events to celebrate National Poetry Month. Saturday, July 11 BEASTCRAWL, an eclectic, free evening of literary and musical performances in various locations in uptown Oakland. This “beating literary heart of Oakland” is organized into 4 legs, starting at 5 pm and ending…well, late! Friday, November 13 7:00 p.m. Nefeli Caffe, 1854 Euclid Ave (near Hearst) in Berkeley. I will be a featured reader with Ramsay Bell Breslin as part of the Last Word Reading Series, a long-running poetry series hosted by Dale Jensen, Ralph Drano, John Rowe, and Grace Grafton. The evening includes an open reading. Admission is free, but a one-drink or one-plate minimum is suggested. Sunday, April 27 7:30 p.m. Great Overland Book Company hosts a reading by Writing Salon teachers Julie Bruck, Alison Luterman, Ben Jackson, Jane Underwood and me. Come snag a seat in the cozy upstairs area and browse the excellent poetry section of the store. Address: 345 Judah Street between 8th and 9th Avenues in San Francisco’s Inner Sunset district. Saturday, March 2, 9:30 a.m.-12:30 p.m.
authors, a book signing, and an open reading. A free and festive event honoring contest winners from across the country. Thursday, June 6, 7:00-9:00 p.m.
Wednesday, August 7, 7:00-9:00 p.m.
A monthly poetry reading hosted by David Rosenthal focused on formal poetry, with two featured readers, a brief interview, and an open reading.